One of the jewels of Best of Luck for me was the development of the relationship between Siobhan and Crew. This is no run-of-the-mill boy-meets-girl story. What a great romance novel! . . . The Irish details are enchanting but when added to the romance it really added a nice twist. 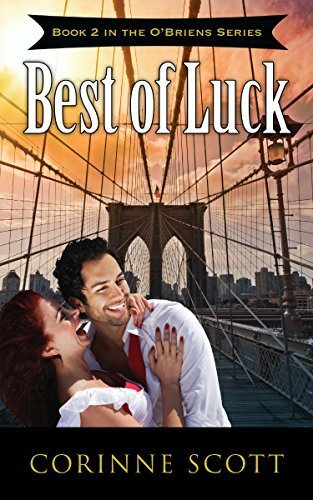 Siobhan falls for Crew, literally, after they collide while he is moving into her apartment building. Their attraction is immediate and powerful, but they are rivals. Siobhan is counting on the Lion winning the St. Patrick’s Day Pub Crawl, which Crew has entered as well. The lead-up to the event involves “pranking” your competition, and the older pubs band together against the gaudy newcomer, with its McNaughty the Leprechaun and other cultural stereotypes. For Crew and Siobhan, the pranking quickly gets personal and expensive. This is a romantic story of a handsome man and a beautiful no-nonsense woman. Siobhan is recently promoted as the Irish pub manager that their family owns. She wants to prove herself as a good manager and thinks entering the pub crawl is her best opportunity. She hates the new Pub opening in town O’Shaughnessy’s Shenanigans, which is not a genuine Irish pub as per her opinion. But, at last, she falls in love with Crew, the owner of the new pub. Due to the serious pranking between the pubs in the competition, things go out of control and these become a hurdle in the love life of Siobhan and Crew. I liked the narration which is casual and friendly. The plot is good even though not very thrilling or mysterious to be considered a Romantic Suspense. The chemistry between Siobhan and Crew is good. The family of Liam and their relationship is great. I found it a quick romance read. I would recommend this to the readers who love Romantic stories with very good characterization. PS: I have received this book from the author through Great Escapes virtual book tours in exchange for a review and this is my honest opinion on the book. Corinne Scott was born and raised in San Antonio, Texas. Her parents were teachers, so of course, she grew up to be a teacher as well, proving that the apple does not fall too far from the tree. Corinne has a bachelor’s degree from Texas State University and a master’s from the University of North Texas. She is passionate about books, which led her to her current occupation as a librarian and author. For more information and links to social media, click here.